Earlier in August I was over the moon to attend one of the first workshops run by the newly established Yorkshire Sound Women Network. Founded in July of this year by Liz Dobson from the University of Huddersfield the aim of the network is to bring like-minded women in Yorkshire together to share knowledge and skills in music and sound technology. ‘Modular Synthesis Basics’ was a workshop lead by musician and synth enthusiast Zoë Blade. We started with an introduction to sound theory to better enable us to get the most out of the part of the workshop where we were let loose on the hardware. The workshop had been deliberately restricted in size to allow as all the opportunity to explore the range of synths, from Zoë’s own collection and from the university’s impressive archive. Liz also demonstrated some of the principles Zoë had explained via soft synths, which was a great way to refresh the theory before we began tangling ourselves up in patch cables. Secondary to Liz and Zoë, the stars of the show for me were a pair of EMS VCS3s, as used by the Radiophonic Workshop, from the university’s collection. A relaxed and inclusive environment, nobody felt the need to try and suppress their gasps of excitement as we managed to cajole the temperamental machines into producing DrWho-esque bleeps and bloops. It was a great afternoon of learning new things, meeting new people and having lots of old fashioned noisy fun. 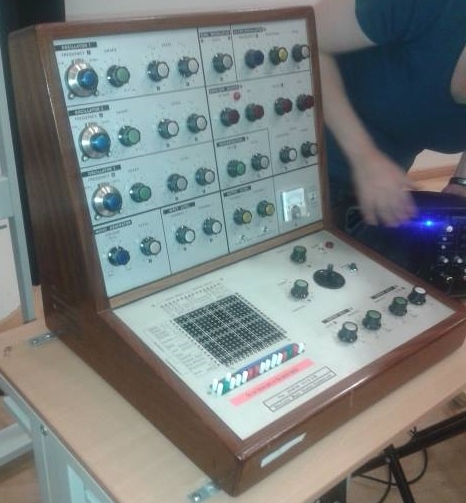 This entry was posted on August 21, 2015 by hazyhazy in Electronic Music and tagged modular synthesis, University of Huddersfield, VCS3, workshop, Yorkshire Sound Woman Network, YWSN.